Pieris are compact evergreen slow-growing shrubs. The young leaves are pink to red, turning cream and then green as they mature. The shrub also features clusters of small white bell-shaped flowers in spring. These look a little like Lily of the Valley, which is how the shrub gets its common name—Lily of the Valley bush. However, some varieties have pink flowers. Pieris is a useful shrub to have in the garden as it adds year-round interest. 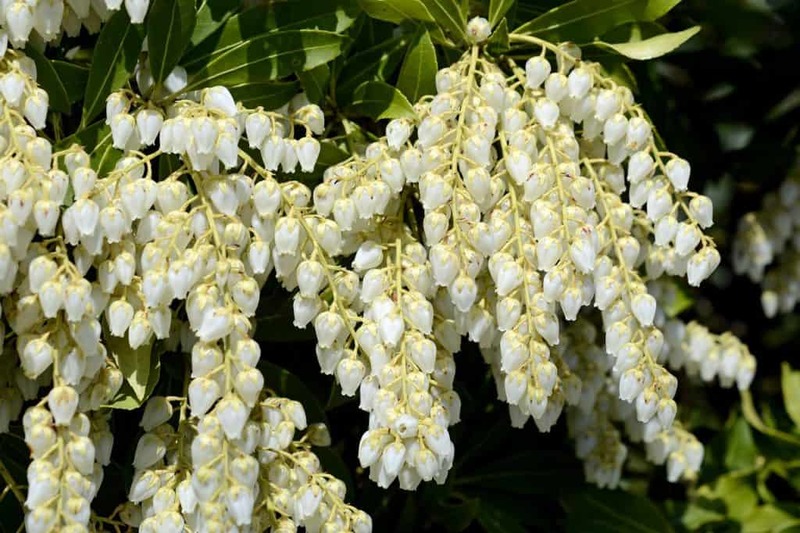 The new, brightly coloured growth and clusters of white flowers are very attractive in spring, and the glossy evergreen foliage keeps looking wonderful all year. It also has flower buds throughout autumn and winter. The shrub is compact and slow growing making it perfect for smaller gardens and mixed borders. Many varieties are compact enough to be grown in a large container, which is useful if you want to grow this acid-loving plant but have alkaline soil. The plant originates in forested mountain regions of China, Japan and Taiwan. In their wild habitat they can grow to 10 metres (33 feet), however, the cultivated varieties are more compact reaching heights of 1 – 4 metres (40 inches – 13 feet). They are also quite a slow-growing shrub, so even the larger varieties will not reach their full height and spread for up to 20 years. Pieris are ericaceous and will need acid soil to do well. They go well with other ericaceous plants such as rhododendrons, azaleas and camellias which will thrive in the same conditions. If your garden has alkaline soil, you will need to plant your shrub in a container. This guide will tell you all you need to know about choosing, planting, pruning and taking care of your Pieris. All Pieris varieties have attractive coloured foliage and pretty sprays of flowers. They do, however, vary in colour and some have variegated leaves. Most varieties flower in March through until early April, but in some milder seasons, they may bloom a little earlier. This is the most common and widely grown variety and the one most people are familiar with. It has pale pink to bright red new growth which contrasts wonderfully with the abundant panicles of white, bell-shaped flowers. The foliage fades to cream and then green as it matures. It can reach a height of 2.5m (8 feet) when mature but, because of its low growing nature, this can take some years. ‘Forest Flame’ requires a sheltered, partially shaded spot in moist but well-drained, acidic soil. This variety has pretty, variegated leaves with pink new growth. It also has sprays of white flowers. A smaller variety this one only reaches 1 metre (40 inches) after 20 years making it perfect for growing in smaller gardens or containers. This striking variety features dark maroon new growth maturing to dark, glossy evergreen leaves. It is another smaller variety reaching an ultimate height of 1 metre (40 inches) after 20 years. Again, it is suitable for growing in containers or where space is limited. This one has pretty, variegated leaves but does not bloom as abundantly as other varieties. It is the smallest variety reaching only 60 – 100 cm (24 – 40 inches). Little Heath Green is a non-variegated variety. This variety, as the name suggests, has bright, fiery red new growth. It also produces a lot of white flowers. It reaches a height of 1.8 metres (6 feet). A taller variety this reaches a mature height of 2.1 metres (7 feet). It has dark pinky-red flowers and red leaves in spring. Pieris is a hardy shrub that can survive very low winter temperatures. Occasionally, a late frost may burn new growth and flowers which affects the wonderful spring display. Protecting your plant from late frosts with a fleece can prevent this. In a sheltered part of the garden, it will probably be fine. In their original habitat of forested mountains, these plants would have experienced dappled shade, and this is what they prefer. Strong sunlight, especially in spring, can damage new growth. Strong sunlight can also prevent them from flowering as abundantly and may result in new growth being less intensely coloured. For this reason, choose a dappled shade environment that mimics their forest home. Your plant will need regular watering until it becomes established. Thereafter it will only need watering during prolonged spells of dry weather. Never leave your Pieris sitting in waterlogged soil. Pieris need acid soil. If you have an alkaline soil you will need to grow your plant in a container with ericaceous compost. A neutral soil can be made more acid by the addition of ericaceous compost and a yearly mulch of well-rotted pine needles. But this will need to be repeated regularly to keep your plant in good health. They do not like to be waterlogged and prefer a rich but well-drained soil, much as their natural habitat would have provided. Even when planted in an acid soil, these plants will benefit from an annual mulch of well-rotted pine needles. In addition, plants may benefit from a dose of fertilizer suitable for ericaceous species in spring. Yellowing leaves are a sign of nutrient deficiency so if your plant shows signs of this it may need an additional dose of fertiliser. Container-grown plants should be fed with a fertilizer suitable for ericaceous species. Plant your Pieris to the same depth as it is in the pot and keep well-watered until it is established and putting on new growth. Your shrub will need extra watering in its first season, thereafter it will only need watering in prolonged dry spells. Compact varieties do well in containers. Choose a container slightly larger than the pot your plant came in. Put few shards of terracotta pot in the base of the pot to prevent the drainage holes from becoming blocked. Pot up in ericaceous compost. Raising the pot on feet, bricks or stones can also help with drainage. Plants in pots are particularly susceptible to drying out so keep an eye on them all year round. They will need feeding with a liquid fertilizer suitable for ericaceous plants in spring. You will need to repot your shrub every couple of years as it grows. Choose a pot slightly larger than the rootball of your existing plant and add fresh ericaceous compost. Removing faded flowers will encourage your plant to put its energy into new growth rather than producing seeds. Cut off all the stems of spent blooms with clean secateurs. To conserve moisture, prevent weeds, keep the roots moist and retain the acidity of the soil, you should mulch with well-rotted pine needles or ericaceous compost, keeping the mulch a few inches away from the base of the plant to prevent rotting. You can feed your plant with an ericaceous fertilizer in spring at the same time as other acid-loving plants such as camellias, rhododendrons and azaleas. Pieris does not require much pruning as it is a slow-growing plant. To keep your plant in good condition simply remove any dead branches. If you do wish to prune your shrub this should be done immediately after flowering to ensure you do not lose next year’s blooms. You can prune your Pieris to keep it to a certain size or to improve its shape. This should be done after flowering. If you prune your shrub in summer or autumn, you will not get any flowers the following spring. In addition, it will encourage new shoots which will not have a chance to harden off before winter and well may be damaged by frost. However, in the long run, the plant will not be harmed. If your plant is damaged by frost you can prune off the damaged shoots back to a supporting branch. Your plant will then put on another flush of growth, so you will hopefully still get a good display of colourful foliage. You can also encourage new growth by cutting some of the longer branches back by half. This will encourage a second flush of new attractive coloured growth. You will, however, sacrifice flowers on that branch next spring. If your Pieris has outgrown its position or become misshapen you can prune it back hard, preferably in late spring. You may not get any flowers for a couple of years after this, however, you should get plenty of fresh, coloured foliage as the plant will put on new growth to compensate for the loss. Your plant will respond well to a hard cut back and will soon recover a good shape and dense growth. Pieris may be propagated from seed. For best results do this in spring. To test the seeds for viability soak them in water for 24 hours. If any seeds float to the top do not use them. Plant one seed per 4” pot using a mixture of three parts compost to one part perlite. Fill the pot to half an inch from the top and firm down. Place the seed on top and scatter a thin layer of compost over the seed to allow light to penetrate. Mist the pot with water and cover with a plastic bag to prevent drying out. Put the pots in a cold frame or unheated greenhouse in a position that is shielded from direct sunlight. Keep an eye on the pots and mist them if they become dry. However, avoid waterlogging them as this can cause the seeds to rot. The seeds should germinate in 20-30 days after which you can remove the plastic bag. Grow them on until they reach around 3 inches and have several sets of leaves. They are now ready for planting out or potting on into containers. Pieris are easy to propagate from softwood cuttings. This should be done in the spring, after flowering. For best results, water the parent plant well a couple of days prior to taking the cuttings, then take your cuttings early in the day when the stems are full of sap. Prepare a 4” pot with a mixture of half compost and half perlite and firm down. Choose a 4-5-inch-long stem from the tip of a healthy branch. The stem should be flexible with young leaves but no flowers. Cut at a 45-degree angle with clean sharp pruning shears or a knife. Remove the leaves from the lower part of the stem and dip the base of the cutting in rooting hormone powder. Make a hole in the pot of compost with a dibber or pencil and place your cutting in. Firm around it gently. Mist the plant and then place a plastic bag over the pot, secured with an elastic band, to keep in heat and moisture. Place your cuttings in a cold frame, unheated greenhouse or in a sheltered position in the garden. Keep moist and protect from direct sunlight. The cutting should have taken in 8-10 weeks. You will know it has taken because you will see signs of new growth. You may also see roots coming out of the drainage holes in the pot. In another 2-4 weeks, your new plant will be ready for planting out. This is a winged insect which causes the leaves to become pale, mottled and bleached-looking. The insects can often be spotted on the underside of the leaf. They only seem to be a real problem in Southern England and some varieties of Pieris are more resistant than others. If your plant is affected you can use a bug killer spray, however, do not use these when your plant is in flower, as they can harm pollinating insects. Fungal leaf spot causes brown spots to appear on the leaves of your plant which gradually increase until most of the leaf is brown. The leaf then drops off. Fungal leaf spot thrives in warm, moist, humid conditions. Therefore, to prevent the problem occurring, you should keep the foliage of the plant as dry as possible and allow plenty of air circulation. Water your plant early in the day so that foliage has a chance to dry and aim to water the base of the plant rather than the leaves. Make sure your plants are not overcrowded and remove any weeds from their vicinity. You can also thin surrounding plants if necessary to increase air circulation. Thinning the stems of the Pieris itself can also help prevent fungal diseases. It is also wise to remove any plant debris from beneath your plant in spring. When mulching, keep the mulch a few inches away from the base of the plant to prevent rotting. You can treat this fungus with a product containing sulphur or copper octanate. You could also try a spraying with a mild solution of bicarbonate of soda (baking soda), using ½ teaspoon per gallon (4.5 litres) of water. Chemical fungal sprays are also available. Rarely, Pieris may be affected by Phytophthora root rot. If this occurs leaves will turn dull, yellow or sometimes purplish. This may happen on one branch initially and then spread. This disease can be fatal to your shrub. To prevent it, you should ensure your plant is not in waterlogged soil or left in standing water. Potted plants will need good drainage to ensure water does not stay in the pot and leave the roots in soggy conditions. For shrubs planted in the garden be sure not to overwater and allow the plant to dry out between waterings. Q The leaves of my Pieris have gone a sickly yellow colour. Is there something wrong with my plant? Yellowing leaves can be caused by a variety of problems in this acid loving plant. Firstly, your shrub may be suffering from a lack of nutrients. Try giving it an application of fertilizer suitable for acid-loving plants. These are often marketed for other acid-loving plants such as azaleas, camellias and rhododendrons. Secondly, your soil may be too alkaline for your plant. Check your soil pH. If you have an alkaline soil your shrub will not do well. You will need to dig it up and plant it in a pot with ericaceous compost. The final possibility is that your plant is positioned in strong sunlight. Pieris are native to mountainous forest regions and prefer dappled shade. Q I have had my Pieris for about 2 years it looks healthy with green leaves, but they don’t change colour and it has never flowered. What could be wrong with it? The new growth of a Pieris is usually vibrantly coloured ranging from light pink to deeper maroon. If you plant does not have any such growth, then it is not growing at all. Your shrub will need some urgent attention to get it back to health, but this can be done. Firstly, you need to check that your soil is acid. This shrub needs acid soil to thrive. If your soil is alkaline you will need to dig it up and plant it in a pot with ericaceous compost. This may also be the reason your plant has not flowered, though it depends on the age of your shrub. They take a few years to mature before flowering. Q I bought a Pieris "forest flame" and planted it in my garden about 4 weeks ago. The beautiful red leaves on the top have gone from red to pink and now pale cream. How can I make it go red again? Only the new growth of Pieris has this attractive colouring. As the foliage matures it changes colour usually to cream and then green. Don’t worry, you will have a flush of new coloured growth next spring. You can encourage some new red growth by cutting some of the longer branches back by half. This will encourage a second flush of new growth with the attractive colouring that this plant is so well known for. You will not get any flowers on growth that has been cut back late in the year, however, as the plant flowers on last year’s growth.